Are you looking for a LDS Wedding dress that would be appropriate for your wedding? I have been told by past customers that the temple wedding dress worn during the ceremony has to meet certain criteria. The neckline front and back has to be cut high. It must be white in color,no Ivory or off white variations. The gown must have long sleeves, if a gown has sheer sleeves they must be lined. Any sheer areas on a gown would have to be lined. No trim or beading should be present on the gown. The dress itself must be long, having no train or one that can be detached or bustled. Although it can be tough to find a bridal gown to meet these guidelines... it's a challenge that can be met! To be on the safe side, some brides use their temple dress as their wedding dress for the temple ceremony and then use a more elaborate or short sleeve gown after the temple ceremony. "I altered a wedding dress for a Mormon bride who picked a dress for her wedding that she could use as a temple dress after the ceremony. Her wedding dress turned out to be a practical purchase since she would be able to wear it again." Check out these web sites! You will be surprised at the beautiful wedding gown styles these web sites have. I was very impressed with a lot of the designs! Check out Latterday Bride has a large selection of styles. Look at Totally Modest for simple and stylish designs for a modest bridal gown. Beautifully Modest has wedding dresses and modest bridesmaids dresses. Hopefully the sources above have been helpful to you in finding the perfect LDS wedding dress for you! Want some additional tips on how to find a modest wedding dress? Read these helpful tips. Read this helpful advice on buying wedding dresses with sleeves. 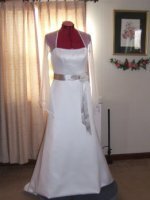 Check out the wedding dress shop gallery for modest gowns with sleeves. Here is a list of wedding dress designers that design modest temple wedding dresses or will modify a dress to fit your needs.